Ceramic tile has long been a popular kitchen floor choice because of its resilience and a wide range of style options. When properly grouted and sealed, ceramic tile will resist any kitchen spill. And because ceramic tile is almost rock-hard, it stands up well to traffic. The only problem is that it looks like a deceptively easy DIY install. What could be easier? Some mortar, some tiles—voila, you're done. But there is a reason why family-based trade guilds have been installing tile for the last, oh, several thousand years: it's an art. After all, standard ceramic tile installation is not hard; but good ceramic tile installation is. 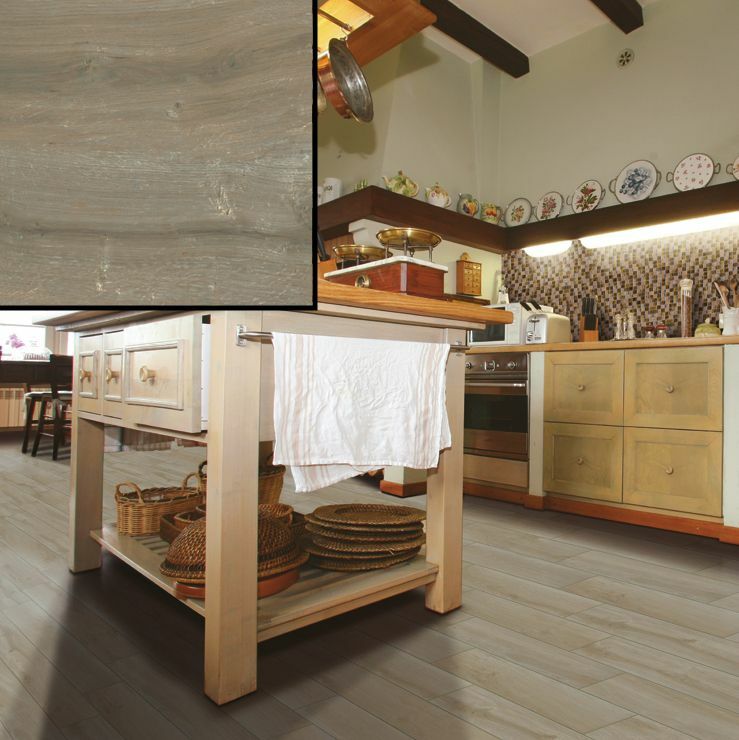 Branch out and try some unusual styles for your next kitchen flooring. Shown here is a highly unusual cobblestone style ceramic tile by Merola. When it comes to kitchen floors, you want something that will shed water and stand up to heavy traffic. Sheet vinyl does all that, and it's a fast install. Best of all, sheet vinyl has no seams (or at worst, one or two seams), to better resist moisture and spills. In fact, when it comes to pure water resistance, sheet vinyl hits the top of the charts. Water can stand on sheet vinyl forever, until it evaporates, and still not damage subfloor or the finish flooring itself. Sheet vinyl comes in wide rolls. The style is shown here, Armstrong Sedona Morning Mauve, comes in 12 foot wide rolls and has what Armstrong calls CushionStep—an extra layer of cushion to combat that "hard feeling" that sheet and tile vinyl tend to have. Because of the unwieldy sheet vinyl rolls and difficulty of installation, sheet vinyl is best left in the hands of pro installers. Vinyl tile is the perfect do-it-yourself project for your kitchen floor. Available in classic 12'x12' sizes (and even up to 18'x18'), tile vinyl can be easily installed simply by peeling off the back "paper" and sticking the tile to the floor. Other vinyl tile flooring may require separate adhesive. In recent years, tile vinyl floor has come a long way since the days of ugly, basic black, white, or (badly done) faux stone tiles. Now, tile vinyl has richer, deeper colors and more realistic textures. Not only that, but the self-adhesive tile stick better and stay in place longer, with fewer curling edges. Shown here is Armstrong's Dakota Sandstone Almondine in the larger 16'x16' sizes (think: larger tiles means fewer tiles to lay down!). As a kitchen floor option, laminate does not rank at the top. Laminate can be hard underfoot (though with padding, this can be mitigated), and water tends to infiltrate between the seams. Still, if you want the look of wood in your kitchen, without using real hardwood, a laminate is not a bad idea. It is possible to get glue-less seams—but the slightly more laborious glued seams will better protect your substrate from moisture. Laminate is a quite easy DIY install—not as easy as vinyl tile, but certainly not as difficult as ceramic tile. Shown here is good, plain old-fashioned beech from Pergo. Organic materials—meaning wood—are never the top choice for kitchen flooring. Water contacts the organic material, and despite your best intentions with finishing and sealing, the water eventually works into the wood's raw fibers. That's why solid hardwood isn't a really smart choice for the kitchen. But what about a product that, from a functional standpoint, is better than solid wood flooring? That's the best way to describe engineered wood flooring. The top layer is hardwood veneer, and everything else below is a high-grade, dimensionally stable plywood. You never want water to stand on engineered flooring. But this material can take minimal contact with water and still come out ahead. Put simply; it's the best wood flooring option for a kitchen when you want real wood--not ceramic tile or vinyl that looks like wood or even laminate flooring.